Without water to support its body weight, a vertebrate out of water had to cope with the stronger pull of gravity while remaining mobile. This adaptation was accomplished through a gradual but complete overhaul of the vertebrate skeleton to maximize its weight-bearing components and limbs. The transition from fish to four-legged animal did not occur suddenly, but over the course of thousands of generations of many species of creatures. Before the fossil record begins to show unequivocal evidence of animals that could be called tetrapods, there are many examples of evolutionary stages bridging the transformation from fish to limbed animals. Collectively, this evidence shows a progression in skeletal features that led to improved weight-bearing design and other improvements that improved tetrapod adaptation for shallow water and eventually terrestrial life. Skulls of early tetrapods offer clues to a variety of physiological changes that took place as these creatures adapted to life on land. Compared with the skulls of lobe-finned fishes, the head of the tet-rapod gradually became flatter and wider. Changes in the location and size of skull openings point to adaptations for breathing as well as improved eyesight. Nasal passageways developed inside the skull to connect the nostrils to the mouth. Tetrapod jaws became heftier than those of fish, and the skull grew stronger through a fusing of many of the bones that made up the lighter, more fragile skulls of the tetrapods' fish ancestors. 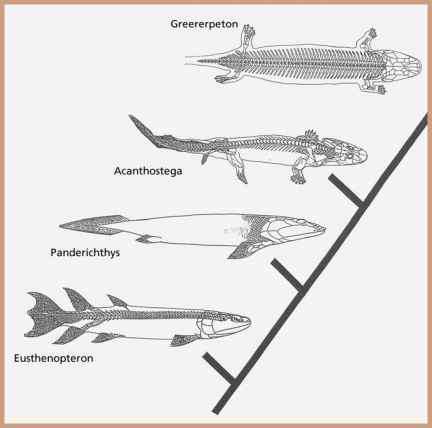 Early tetrapods had two rows of teeth in their lower jaws, as did their fish ancestors. In later tetrapods, however, the teeth of the inner row became smaller, and the teeth of the outer row became larger and fewer than in fish, perhaps marking a transition to feeding on land. Skeletal modifications that led to land-dwelling tetrapods included the strengthening and repositioning of limbs to be weight-bearing, the addition of limb joints to make terrestrial locomotion possible, and the development of longer trunk ribs to shape and support the body out of the water. Whereas fish mostly gulp in their food and snag it on their many smaller teeth, tetrapods used their larger outside row of teeth to snag fish and other small prey such as insects. 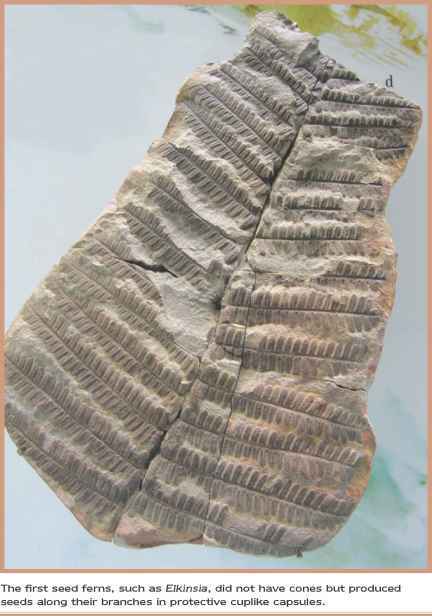 Tetrapods primarily ate fish until well into the Early Carboniferous Period. 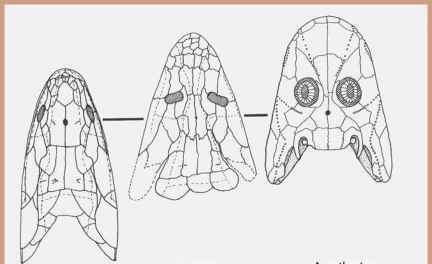 The transition from the skull of a fish, such as Eusthenopteron, to that of a tetrapod, such as Acanthostega, shows that the eyes of early tetrapods not only became larger than their fish ancestors but began to migrate to the dorsal surface of the head. dwellers in shallow waters to raise up their heads to breathe air. It also led to the development of a flexible neck in many kinds of later land vertebrates. The spine, or vertebral column, of the first tetrapods was markedly different from that of lobe-finned fishes. The fish backbone was not connected to the pelvic girdle, and the individual vertebrae that made up the spine were simple, lightweight discs that were fairly uniform in size and contained short, spindly, riblike structures. The tetrapod spine developed stouter, interlocking vertebrae with sturdy ribs that extended down along the sides of the animal. The presence of longer ribs in tetrapods is one of the clues that paleontologists look for when faced with a partial skeleton from the Devonian that could be from either a fish or a land animal. The vertebral column of the tetrapod was joined to the animal's two pairs of limbs by pectoral and pelvic girdles; this arrangement provided strength and flexibility to the body. The tetrapod vertebral column was strong and capable of supporting the weight of the animal as it walked. The limbs of the tetrapod were attached to the pelvic and pectoral girdles. The transformation of fins to limbs was of prime importance; it enabled the tetrapod to move around. The limbs and feet had to support the weight of the body while also providing stability for locomotion. The limbs were equipped with another innovation: flexible joints (wrists and ankles) that allowed the animals to maintain balance and traction on uneven terrain. Whereas fish move primarily by undulating the body and tail, tetrapods had to work out a new plan for walking and running on land. One requirement for tetrapod walking is that at least three feet have to be on the ground at the same time. This prevents the animal from losing its balance. Tetrapod locomotion is typified by what is called lateral undulation of the trunk. This is a kind of waddling in which one leg is lifted and moved forward while the other three legs remain in contact with the ground. If one were to look down on a tetrapod and watch it move in slow motion, one would see it lift its left forelimb first, followed by the right hind limb and then followed in turn by the right forelimb and the left hind limb. The transition from underwater locomotion to walking on land took many interim stages to perfect. In fish, the limbs were shorter and pointed backward from the anterior of the animal. Paleontologist Jennifer Clack of Cambridge University suggests that the earliest tetrapods most likely crawled along on their bellies and used their legs only to pull themselves along or change direction. It was only later that stronger, longer, supporting limbs sprawled out from the sides of the animals and enabled them to walk as amphibians and reptiles walk today. The limbs of tetrapods owe their evolutionary origins to the lobe-finned fishes, whose bony appendages bore many of the bones that later were maximized for strength and mobility on land. The number of digits (fingers and toes) of the early tetrapods also reveals a period of experimentation in the evolution of these animals. Although five fingers is the rule of thumb for modern tetrapods, even humans, this was not always the formula for success. Clack and her associates have examined a wide range of specimens to show that in the early tetrapods, the number of digits ranged from five to six, seven, and even eight. It is not yet known whether the five-fingered tetrapod evolved from an earlier eight-fingered version, such as Acanthostega. What is known is that at some point in the evolution of these animals, those with five fingers managed to survive more often and so outlasted the other varieties. Clack surmises that five fingers turned out to be the optimum number for bearing weight and providing adequate flexibility for walking. Is the skull weight bearing?